Maximize your beach time while at the Oregon Coast! Oregon’s coastline is graced with unforgettable vistas: dramatic cliffs, offshore rocks and sea lions, wide sandy beaches, majestic capes, historic lighthouses, enchanted forests and lovely small beach towns which artists and artisans make their home. 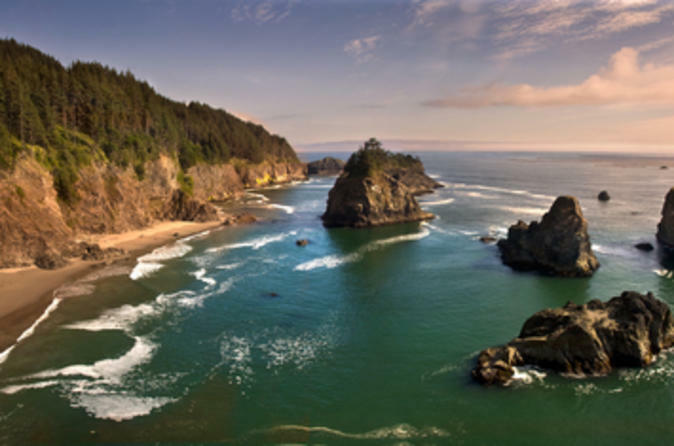 Locations we may visit include: Cannon Beach, Haystack Rock, Short Sand Beach at Oswald West State Park, Neahkahnie Point, and Manzanita while enjoying spectacular views of the dramatic Oregon Coastline. Neahkahnie Point: This peak is an inspiring place, where the Tillamook tribe believed their most powerful god resided. In fact, the name Neahkahnie comes from their words Ne ("place of") and Ekahnie ("supreme deity"). Manzanita: Manzanita is a beautiful oceanside city with seven miles of sandy beach and the third most photographed scenery in Oregon. While here you can enjoy a spectacular walk by the ocean or explore their lovely downtown. Short Sand Beach/Oswald West State Park: Stretching along four miles of coastline in dense, temperate rainforest, Oswald West State Park has a beautifully secluded sandy beach and miles of trails leading to breathtaking views of the Pacific Ocean. This vast, scenic treasure is without a doubt one of the most spectacular parks in Oregon. Cannon Beach: This picturesque small-town village by the sea is easily walkable and you will be able to explore meandering pathways, enjoy public art and courtyards spilling over with flowers. Known as one of the Northwest’s top art towns, Cannon Beach is filled with art galleries, specialty shops, cafes and fine dining restaurants. While in Cannon Beach you will have time for lunch at one of their amazing restaurants. Cannon Beach is also famous for its amazing beaches. Historic Haystack Rock: Haystack Rock is one of Oregon’s most recognizable landmarks, home to colorful tidepools and diverse bird life. It rises 235 feet from the edge of the shoreline. At low tide, you can walk right up to it and find colorful sea stars and other fascinating tidepool creatures in its intertidal area. Puffins can be observed on Haystack Rock from early spring to mid-summer, offering the most accessible viewing of Tufted Puffins in the Northwest. Ecola State Park: No visit to Cannon Beach would be complete ­without visiting Ecola State Park, perched dramatically on the edge of Tillamook Head. Ecola Park Road winds through old growth rainforest before emerging at one of the Oregon Coast’s most famous views, overlooking numerous rock formations and the capes and headlands miles to the south.